In addition to the League Prizes a number of trophies are awarded across various categories. Some are awarded depending on results whereas others are awarded by the committee. The same rules regarding the number of meets attended apply as for League Prizes. Winners of any League Trophy should return it by the end of the next season so that it can be engraved with the new winners name ready for the prize presentation. Awarded to the Junior rider who is highest placed in the Senior Leagues. Awarded to the Youth rider who is highest placed in the Senior Leagues. This trophy is awarded to the Senior rider whom the committee have decided enhanced the seasons racing by making regular breaks and/or attacking during bunch races. Awarded to the youth rider competing in the youth leagues that the committee have decided is the most deserving for a number of reasons. Decided based on points won in the final senior distance race of each evening throughout the season. As well as the standard points for 1st to 6th any Prime winner also gains one point. Awarded to the rider in the Youth A or B categories that has made up the greatest aggregate distance when winning a handicap race. 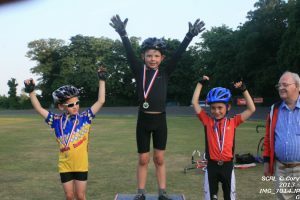 Basically each week for the winner of the Youth A&B handicap race we work out how much distance they made up over the rider with the biggest handicap. Every time a particular rider wins this gets added to their season total. The rider with the biggest total at the end of the season wins. If we split the handicaps the winner that made up the biggest distance gets that added to their total.